This post covers both Martha Elizabeth McKenney and her daughter’s marriages into the same Campbell family. If any descendants ever happen this way, I would love a little more information on the families and, if they are had, some photographs. Martha McKenney, daughter of George Washington McKenney Sr. and Isabella, was born, according to census data, abt. 1852 in Ohio. She died before 1874. 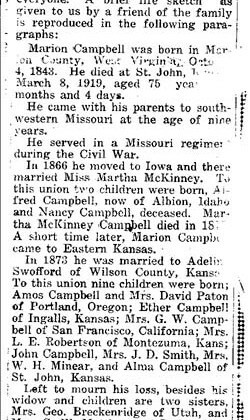 Martha married Marion CAMPBELL, son of John Campbell and Nancy Kendall, 1867 Sep 12 in Wapello County, Iowa. Their marriage is indexed in “Iowa, County Marriages, 1818-1934”. Marion CAMPBELL was born in Marion County, West Virginia, Oct 4, 1843. He died at St. John, KS., March 8, 1919, aged 75 years months and 4 days. He came with his parents to southwestern Missouri at the age of nine years. He served in a Missouri regiment during the Civil War. In 1866 he moved to Iowa and there married Miss Martha MCKINNEY. To this union two children were born, Alfred CAMPBELL, now of Albion, Idaho, and Nancy CAMPBELL, deceased. Martha MCKINNEY CAMPBELL died in 18xx (unreadable). A short time later, Marion CAMPBELL came to Eastern Kansas. In 1873 he was married to Adelia SWAFFORD of Wilson CO., KS. To this union nine children were born: Amos CAMPBELL married Mrs. David PATON of Portland, Oregon; Ether CAMPBELL (sic) of Ingalls, KS; Mrs. G. W. CAMPBELL of San Francisco, California; Mrs. L. E. ROBERTSON of Montezuma, Kansas; John CAMPBELL, Mrs. J. D. SMITH, Mrs. W. H. MINEAR, and Alma CAMPBELL of St. John Kansas. Left to mourn his loss, besides his widow and children are two sisters, Mrs. Geo. BRECKENRIDGE of Utah, and Mrs. G. W. MATTHEWS of Dodge City, 31 grandchildren, and 7 great-grandchildren. He was baptized into the Church of Jesus Christ, April 6, 1876 and has been a faithful member from that time until the day of his death. He was always active in church work and was consistent in upholding and practicing the doctrines and ordinances of the church. The funeral service was conducted by the Elders of the Church at … grave in Fairview Cemetery at 2:.. o’clock Wednesday afternoon, March 12th. I will cover Martha’s family in a separate post and just write of the Campbells and her situation post marriage here. Marion Campbell was born 1843 Oct 4 at Mannington, Marion, West Virginia. The Campbell family had gone out to Iowa in 1846 but had returned east to Western District, Marion, Virginia by 1848. Before 1854 the migrated to Putnam Missouri where we find them in the 1860 census in Richland, Putnam, Missouri. The census shows two interesting things. One, they are living a couple of doors from a Peter Probasco who was in Farmington, Van Buren, Iowa in 1850, and the McKenneys and family were in Van Buren. Then, two households away we also have a Bryant Flanegin. 745/625 Peter PROBASCO 58 NY and Sarah 58 children born IA. 1850 census shows in Farmington, Van Buren IA. In the 1850 census in , Putnam, Missouri, this was the line up. A William Level is three households from the John Flanegin family in which is Bryant. Always looking for Nemaha Reserve connections close to the McKenneys and relations, we find one here with William Level. By 1854, about the time of the migration of the Campbells to Putnam, the Level household moved to Archer, Richardson, Nebraska. John Speery, b. in N. Y., blacksmith; 1 m. 21 up. ; 1 m. und. 16; 1 f. 16 up. ; 1 f. und. 16. John P. Roy(a), b. in Mo., trader; 2 m. 21 up. ; 1 m. und. 16. Thomas Little, b. in 0., carpenter; 1 m. 21 up. William Levell(a), b. in Ill., farmer; 2 m. 21 up. 2 m. und. 16; 4 f. 16 up. ; 10 f. und. 16. F. Helling, b. in Germany, farmer; 1 m. 21 up; 1 f. 16 up. John C. Miller(a), b. in S. C., farmer; 5 m. 21 up. ; 3 m. und. 16; 4 f. 16 up. William McDonald, b. in 0., farmer; 3 m. 21 up. ; 1 f. 16 up. Mrs. F. E. Davenport(a), b. in 0., farmer; 1 m. 21 up. ; 1 m. 16 up. ; 1 f. 16 up. ; 2 f. und. 16. Louis Missplay(a) (b), b. in France, farmer; 2 m. 21 up. ; 2 m. und. 16; 1 f. 16 up. ; 2 f. und. 16. Joel Harper, b. in Ind., farmer; 1 m. 21 up. ; 1 m. und. 16; 1 f. 16 up. ; 3 f. und. 16. John Herkendorff(a), b. in Germany, farmer; 2 m. 21 up. ; 2 m. 16 up. ; 1 f. 16 up. ; 1 f. und. 16. William Tramell, b. in Tenn., farmer; 3 m. 21 up. ; 2 m. und. 16; 3 16 up. ; 1 f. und. 16. R. Leachmans(a), b. in 0., farmer; 1 m. 21 up. ; 2 m. und. 16; 1 f. 16 up. A. Shelly, b. in III., farmer; 4 m. 21 up. ; 2 f. 16 up. N. J. Sharp(c), b in Ill., farmer; 2 m. 21 up. ; 1 f. 16 up. Jessee Crook(d), b. in Tenn., farmer; 6 m. 21 up. ; 2 m. und. 16; 1 f. 16 up. ; 1 f. und. 16. [p. 1] Charles Robinson(a) (b), b. in Tenn., farmer; 1 m. 21 up. ; 1 f. 16 up. Davids Robinson(a), b. in Tenn., farmer; 3 m. 21 up. ; 1 m. 16 up. ; 1 m. und. 16; 2 f. 16 up. Joseph Boyd, b. in Mo., farmer; 1 m. 21 up. ; 2 f. 16 up. ; 6 f. und. 16. Joshua Boyd, b. in Mo., farmer; 1 m. 21 up. ; 2 m. und. 16; 1 f. 16 up. ; 2 f und. 16. William Level(c), b. in Ky., farmer; 1 m. 21 up. ; 2 m. und. 16; 2 f. 16 up. : 8 f. und. 16. Frank Purket(a)(d), b. In Mo., farmer; 1 m. 21 up. ; 1 f. 16 up. John Strumbo, b. in Va., farmer; 2 m. 21 up. ; 1 m. 16 up. ; 1 m. und. 16. George Mayfleld(e), b. in Del., farmer; 1 m. 21 up. ; 1 f. 16 up. ; 2 f. und. 16. James Miller(c), b. in Va., farmer; 1 m. 21 up. ; 2 m. und. 16; 1f. 16 up. David Boyd(c)(f), b. in Mo., farmer; 1 m. 21 up. ; 2 m. und. 16; 1 f. 16 up. ; 1 f. und. 16. William Boyd(g)(h), b. in N. C., farmer; 2 m. 21 up. ; 2 f. 16 up. ; 2 f. and. 16. In 1857, Dec. 6, the daughter of William Level (William S. Leavel) married Thomas C. Lytle, who we can see in the 1854 census is working on the Nemaha Reservation. It appears, at least from the census, that the Campbells may have moved into the approximate location where the Leavels had been in Missouri up to 1854. They are at least several households from John Flanegin and Bryant Flanegin, with whom the William Leavel family would have been acquainted. By 1866-1867, Marion Campbell had married Martha. The 1870 census shows Marion Campbell and Martha Elizabeth in Neosho County, Kansas, where both the parent McKenney and Campbell families are observed. 103/103 PAGET Jaccob L. 32 b. IL and Eliza and family. NOTE: John is father of Marion and William. The family was in IA in 1847, back to VA then back to IA by 1854. Then were in MO in 1859 then back in IA by 1861. John’s family is on page 400 of the WV Marion co. Western distrct census for 1850. Alfred Washington b. 1868 Aug 16 in , Jackson, Missouri, died 1938 July 19 in Portland, Multnomah, Oregon, will marry about 1892 Ida Louisa Bake who was born 1876 Sep 19 in Fredonia, Wilson, Kansas. Her parents are perhaps Squire and Martha Baker, observed in the St. John, Staford, Kansas census in 1880. Alfred and Ida will be in Rocky Ford, Otero, Colorado in 1910, then Albion, Cassia, Idaho in 1920, and Seaside, Clatsop, Oregon in 1930. A listing of their children is below. Nancy Isabel b. 1870 Feb 14 in Kansas, dies 1892 April 10, on 1887 April 24 in Kansas married Thomas W. Campbell b. 1852 March 18 in Clover Gap, Marion, West Virginia. He was a first cousin of Marion Campbell, Nancy’s father. I’ll list their children below. After Martha’s death in the early 1860s, Marion married Adeline Swafford in 1873. She was born 1854 June 29 in Indiana and died 1937 Aug 8 in St. John, Stafford, Kansas. They had 9 children together: Amos Lanson b. 1874, John William b. 1877, Emma Evelyn b. 1881, Mary Elizabeth b. 1881, Rhoda May b. 1883, Esther E. b. 1886, Zelpha Etta b. 1888, Alma L. b. 1892 and Lille A. b. 1894. The family resided in St. John, Stafford, Kansas. After Marion’s death, Adeline married again, this time to John Morgan b. abt. 1848 in Pennsylvania, died 1930 July 31 in , Stafford, Kansas. Adeline’s parents appear to be John Swafford b. 1817 in Tennessee and Mary b. 1827 in Virginia, who are observed in the 1860 Bean Blossom, Monroe, Indiana census. Adeline was listed as “Nancy A”, 6 years of age. They were still there in 1870 but by then Adeline was out of the household and I’ve yet to locate her in the 1870 census. This is my best guess on her family and has as yet been unconfirmed. Irving/Irwin b. abt. 1905 in Colorado. Eleanor Adaline b. 1890 Oct 12 in Kansas, died 1893 Nov 21 in Kansas, married Ferdinand Love Hall 1908 Aug 22 in Kansas and had children Lewis M., Elva L., Donald M., Owens P. and Ferdine E. In 1900 they were in Liberal, Seward, Kansas. After the death of Isabel, Thomas W. married Minnie Rouse. The 1900 census finds them in Liberal, Seward, Kansas, then in 1910 in Harmony, Township, Stevens, Kansas, 1920 in , Otero, Colorado, and in 1930 in Timpas, Otero, Colorado. Larry McCombs has a notation on an Emeline or Ermeline HALL that was in the McKenney things: “Ermeline Hall wife of Lewis Hall married Apr 26, 1851. Another date on the notation could be 1858 or 1830, can’t be sure.” So, because of this, I was curious about Ferdinand Love Hall, wondering if here I might find something about Emeline Hall and if there was anything of especial significance to this family. After much searching I find that Ferdinand Love Hall was the son of Louis Austin Hall b. 1841 July 14 in , Bates, Missouri, who married abt 1866 in , Council Bluffs, Iowa, Martha Ann Parson b. 1847 March 4 in Covington, Kenton, Kentucky. Louis Austin Hall’s parents were William Hall b. 1815 March 11 in Kentucky, married 1840 July 13 in Missouri to Emaline Wright who was born abt 1818 in New York. The census finds them in 1850 in , Lee, Iowa. In 1860 and 1870 the are in Des Moines, Lee, Iowa. In 1880 they are in Lindley, Mercer, Missoouri. Seven degrees of separation department. In 1870 Mercer the family of the George Washington Martin and Mary Cutler Martin and Thadeus Cutler are living beside George Dunn. George Washington Martin was the son of John J. Martin and Mary A. Wilson. His uncle, via his mother, was Thomas Valentine Wilson m. Mary Bilkey Justus who is observed in the 1850 Lee County, Iowa census above. I 1880, George Washington Martin and his wife Mary Cutler Martin are living beside George Washington McKenney Sr. in Fayetteville, Washington, Arkansas. So, is this the Louis/Lewis Hall family in question? Are facts remembered incorrectly and Emaline is the mother of Louis/Lewis as opposed to the wife? (I have seen this happen several times, where two generations were compressed into one.) If this is the Louis/Lewis Hall, was there another wife before Martha who was named Emaline? The timing would fit. And if so, who was she? What we have found, rooting around, is that long before Ferdinand and Eleanor married, the Halls were brushing shoulders with a family who seems to have been long associated with the McKenneys, which I write of elsewhere on this blog. It’s all a bit of a mystery and maybe one day we’ll know a little more about it. I am the grandson of Donald M. Hall. I happened to see this article and thought I would make contact. My grandfather was a farmer in southwest ks. I also knew my great grandmother Addie Hall who was the wife of Ferdinand, one of the children in the article. Contact me if you would like any further info. Jason, good to hear from you. Will send you an email. Alfred is my great great grandfather. I recently found Alfred’s funeral program in family documents. I know a little about Otto and Oren but really don’t know anything about Orville. I would love to connect with you.